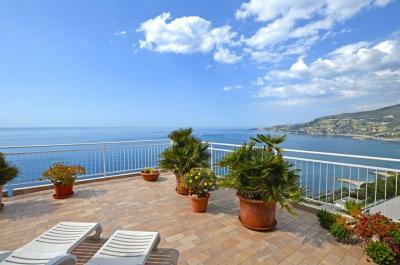 Ospedaletti: Seafront penthouse Apartment for Sale. 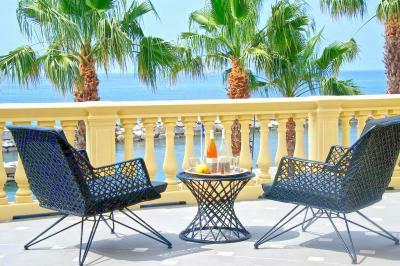 In a prestigious complex with swimming pool, concierge service, restaurant and private beach, directly on the sea, with stunning view of the sea and the gulf of Ospedaletti, penthouse Apartment for Sale with big terrace. 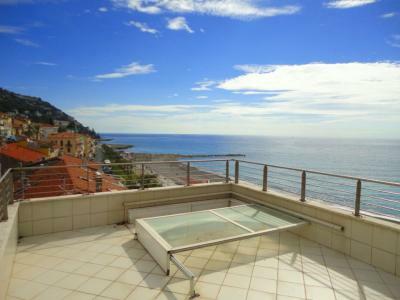 Restored with quality materials, this penthouse Apartment for Sale in Ospedaletti consists of an entrance that goes into the large living room divided into TV area and dining area overlooking the large and sunny terrace with an unique sea view, and a bathroom; sleeping area created by a hallway with double bedroom, main bathroom, and master bedroom with dressing room and a study room.